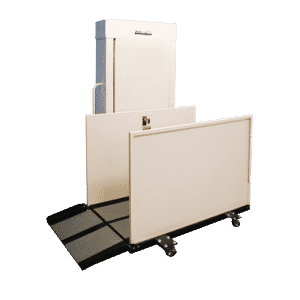 The residential vertical wheelchair lifts Harmar CPL 400 P’s portable package offers users the unparalleled versatility and convenience to use a lift whenever and wherever they need it. It lifts up to 4 ft in height and is able to hold up to 750 lbs. When moving in and around spaces, an extra set of steps becomes a major barrier for wheelchair and scooter users. A solution, such as this ADA compliant portable vertical platform lift, can make the major difference in the way people with mobility needs enjoy a space. Due to its removable caster wheels, the CPL 400 P is ideal for use in schools, theaters, or churches, by providing the versatility of using the lift only when and where it is needed. With an outstanding weight capacity and sturdy design, the residential vertical wheelchair lifts Harmar CPL 400 P provide great ease and comfort for everyone as it is easily transported and installed, which allows it to be used in all sorts of outdoor and indoor spaces. A constant pressure paddle switch with an emergency stop allows for extra safety and its automatic folding ramp is able to hold as much as 750 lbs of weight. Coming from one of the best brands in the market, you can be certain that the Harmar CPL 400 P is a preferred mobility solution for many residential and commercial applications, working with a top-mounted motor and electrical box that makes it safe and reliable under every context. The residential vertical wheelchair lifts Harmar CPL 400 P are only one of the many top quality products we are proud to bring customers in North Carolina. Contact one of our mobility experts today and they’ll guide you through the process of choosing the perfect mobility solutions for you, helping you in the process of making your home or commercial space accessible to all.